Covenant House Illinois Grand Opening. GOLD COAST SHORE REPORT — Second Ward Alderman Brian Hopkins joined with Covenant House to celebrate the grand opening of Covenant House Illinois, helping to keep homeless youth off of the streets. 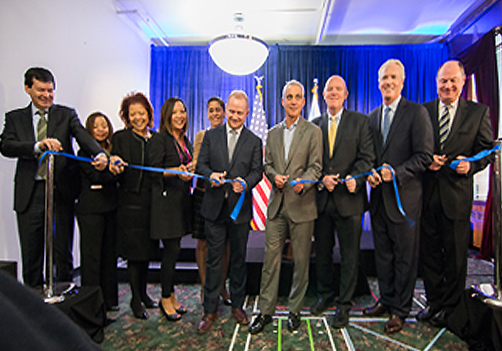 Chicago is the site of the first new Covenant House in 17 years, and has joined a strong field of providers serving homeless youth in the city to bridge the gap between available resources and this critical need. Caring for more than 50,000 homeless and trafficked youth in 30 cities across the U.S. and in six countries, Covenant House International is one of the largest and most renowned homeless service agencies in the nation. The new Covenant House Illinois location will support the chief mission of providing homeless children with ongoing care and crisis support. Thank you to Executive Director Joseph Mole for his great work in the community.